DAVOS, Switzerland — President Trump is the biggest no-show at this year’s meeting of the World Economic Forum. But Brazil’s new leader, Jair Bolsonaro, a man whose nickname back home is the “Trump of the Tropics,” stepped in to take up the populist mantle on Tuesday. Like Mr. Trump did when he came to Davos last year, Mr. Bolsonaro tried to smooth the edges of the insurgent message that vaulted him into the presidency last fall. He pitched Brazil to the well-heeled audience gathered in this Alpine ski resort as a good place to do business — a country committed to rooting out rampant corruption and rolling back regulations. But Mr. Bolsonaro also said Brazil would purge left-wing ideology from its politics and society, and he made no apologies for emphasizing economic growth, something his critics say will come at the cost of protecting Brazil’s environment. 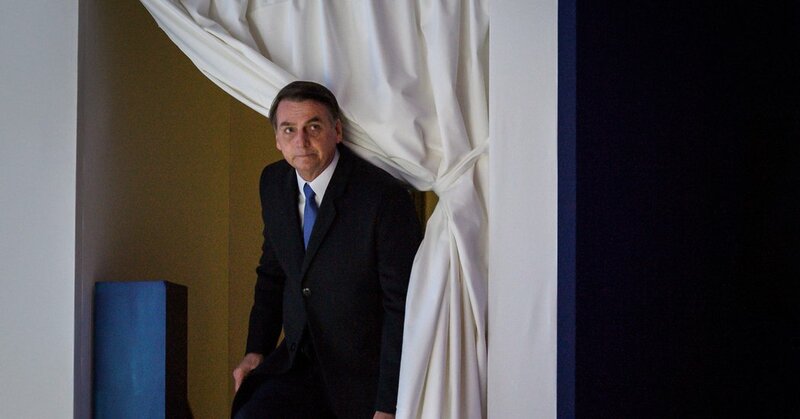 Mr. Bolsonaro’s keynote address set the tone for a Davos gathering shorn of its usual retinue of American and European leaders, wrestling with political forces, from Latin America to Europe, that are starkly at odds with this conference’s ethos of global cooperation and a liberal world order. With his nationalist instincts, strongman style, and history of making crude statements about women, gay people and indigenous groups, Mr. Bolsonaro is in many ways the very antithesis of a “Davos Man” — the term once used to describe the type of person who attends the annual conference. A 63-year-old former Army officer whose victory symbolized the frustration of Brazilians with their corrupt governing elite, he has acted swiftly since taking power to loosen restrictions on guns, curb lesbian and gay rights, and put civil-society groups under tighter control. In November, at the behest of Mr. Bolsonaro, Brazil withdrew its pledge to host the 2019 United Nations global summit meeting on climate change. During the election campaign, many people feared he would pull out of the Paris climate accord, which he has not yet done. On Tuesday, Mr. Bolsonaro insisted that Brazil would “work in harmony with the world, in sync with the world” to reduce carbon emissions, though he did not mention the accord. “Those who criticize us have a great deal to learn with us,” he added. Mr. Bolsonaro and Mr. Trump have cultivated each other assiduously, and the parallels between them are at times striking. Mr. Bolsonaro boasted of winning “despite having been unfairly attacked all the time,” echoing Mr. Trump’s vilification of the news media. Though he was speaking in a heated room, Mr. Bolsonaro wore a long winter coat. Mr. Trump is partial to these as well: He was photographed wearing one recently in the State Dining Room as he posed with a spread of fast food laid out for the Clemson University football team. Mr. Trump, whose presence dominated last year’s meeting, canceled his visit this year because of the government shutdown. He pulled the plug on the rest of the American delegation a few days later, after he denied House Speaker Nancy Pelosi and other lawmakers the right to use a military aircraft to fly to Afghanistan and Brussels. Those who wanted to hear from the Trump administration had to make do with a video appearance by Secretary of State Mike Pompeo, who spoke from the balcony of the State Department, with the Lincoln Memorial over his left shoulder. Mr. Pompeo delivered a faithful summary of Mr. Trump’s “America First” foreign policy, with harsh words for Iran and China. He told the audience that Mr. Trump’s brand of disruption was a healthy response to voters who had tuned out more traditional politicians, and mirrored political upheavals in Britain, France, Italy and Brazil. Prime Minister Theresa May of Britain, who is dealing with the chaos over Britain’s exit from the European Union, and President Emmanuel Macron of France, who is facing a wave of unrest from “Yellow Vest” protesters, both skipped this year’s meeting. Mr. Pompeo said that critics of the Trump administration were not ready to face the challenge of reforming international institutions like the United Nations. “But President Trump is,” he said. Still, the signposts of a changing world order were evident throughout the snow-covered streets of Davos. While Silicon Valley stalwarts like Facebook and Salesforce still put up gleaming pavilions to promote their presence, the biggest billboard belonged to Saudi Arabia, which took up the side of a hotel to encourage visitors to invest in the kingdom. Saudi Arabia’s own investor conference, known as Davos in the Desert, was hit by a wave of cancellations in October after intelligence reports linked the conference’s patron, Crown Prince Mohammed bin Salman, to the killing of the Saudi journalist, Jamal Khashoggi. Along the streets were advertisements for the St. Petersburg International Economic Forum, President Vladimir V. Putin’s answer to Davos. Though few Chinese officials turned up here, the sessions devoted to China’s economy, like the Belt and Road Initiative, drew by far the largest audiences. Although the United States kept a lower profile this year, it continued to cast a long shadow over the gathering. Economic analysts cited Mr. Trump’s trade war with China as a culprit for cutting their forecasts of global economic growth. And foreign policy analysts said Mr. Trump’s erratic style remained the greatest single source of risk in the world.